Kuala Selangor, Sabak Bernam and Sekinchan make up the “rice bowl” of Selangor. The pleasant view of padi fields here is made even more memorable if you stop and learn all about about padi planting. You can do this at Sawah Sepadan in Kuala Selangor, At Block ”O” of the field, Haji Jailani Haji Masnor, 63, and his wife, Hajjah siti Suram, have opened their padi fields and home to tourists. For the last five years, their visitors have included both locals and Singaporeans. The latter are fascinated with padi fields and their children seem to think that the rice they eat is produced in factories. “They can spend a whole day here and they simply love the spicy food we serve,” says Siti. She says many schools organize trips to show students how padi is planted and harvested the modern way. 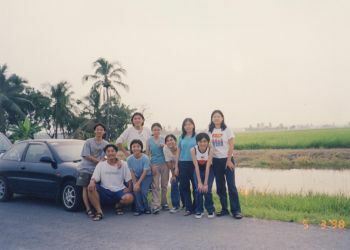 After a brief tour of the fields, thy would adjourn to Siti’s house for a kampong-style lunch of tempe fried in chili, fried glass noodles and vegetables, kampong chicken cooked in special gravy or simply deepfried, tom yam soup, kangkung belacan and fried ikan keli with chili etc. Japanese and Western tourists however, sometimes find the food a little too hot for their taste. The couple opened their home to tourists upon request by the hotel staff. “Cooking and cleaning are not a problem because I do it every day. My husband and children helpme and if we are having a large group, my friends come over to lend a helping hand,” says Siti. Those who want a taste of kampong life amidst padi fields can check out the packages offered by De Palma Inn Kuala Selangor at 03-32897070 or fax:03-32897080.